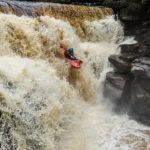 Illinois River 20200 CFS - Part Two | DBP MAGAZINE ONLINE The World's Best Free Whitewater Publication. It is a moment that I still remember vividly, both the thoughts that went through my head, and the darkness that enveloped us. I can’t say for sure how long we were in there. There were multiple boats waiting for us to come out, and I heard anywhere from 1 minute to 2 minutes. It felt like an eternity, but I’ll just average it to 90 seconds. At some point we were sucked down and everything got really dark. At that point I thought the boat failed. I thought, well I’ll just keep holding my breath until I pass out. Kelsey and I both thought that was it, but somehow we popped back up, ending up way below the hole with our boat on our side. My vision was quite blurry, and my muscles were cramped up. I was fairly disoriented and it was very difficult for me to move. One oar blade was bent, the other oar was tangled up in the boat, but somehow Kelsey and I made it to shore. We regrouped with the rest of our party and took a 20 minute break. John gave me some beef jerky. It was good. I did give some contemplation about hiking out at that point. I think a lot of people did. Some more than others, but in the end we all decided to continue. In my mind I thought I should have avoided that hole. It was my own poor decision that brought us there. I wasn’t going to let that happen again. After Pine Flat Rapid, which was just a large wave feature, we drifted for quite a few miles with little to worry about. Eventually we came up to the Red Rock at South Bend. Just a little bit of it was poking out. We regrouped and let everyone know the Green Wall was next. This was the last time we were all together until past Collier Creek. Eventually we made it to Fawn Falls which was more forgiving than at 12000, but there were still some weird features on the left. The river get very wide above the Green Wall, and if you want to catch the eddy at the top it would be difficult at best. You would also be starting on the wrong side of the river after you peel out. We just ran it. The Green Wall was easier initially as the hole on river left was not nearly as retentive, but the eddies at the bottom were very strong, and the waves were just as erratic, with a huge lateral at the bottom coming off of the right wall. 20 foot waves seem to just randomly appear and disappear. I knew from 12000 right was the way to go. The eddy on the left was no fun. I wondered what someone would have thought if they could see our long trail of colorful boats dropping into that water. I think everyone entered the rapid in a similar spot. We all ended up running different lines in the end. George and Shawn got stuck in the river left eddy. My boat and Quin’s got stuck in a room of doom on river right, in the middle of what I call the pinch point. It was very violent in there. I remember Quin and I looking at each other and Quin yelled, “We’re in a really bad spot”. I was thinking the same thing. John’s boat was flipped in the Green Wall, was on it’s side entering the pinch point and kept going. Ryan chased him down. Matt made it through and eddied out on river right. Quin and I circled in that room for a while. The water seemed like it was going by about 60 mph. I was hitting the wall HARD, and I was worried the rocks popping my boat. With some communication between our two boats somehow we both got out, but only after I was slammed into the wall backwards which forced a front flip out into the current. After I got out of the room I eddied out on river left near a waterfall and started the process of hiking upriver to find George and Shawn. This was going to take a while, and I was preparing myself for an overnight stay. However, when I was about a 100 feet above the river I saw them pass by. They got out on their own, but kept going. The river was not going to let them eddy out. By the time Kelsey and I got back in the boat they were well downstream and out of sight. We got into our boat and let Quin know we were going. We played safety for Quin, so he led. It’s full on from here on with huge waves, laterals, and some big holes to mix it up for the next 3 miles. There is a huge rock on the left of the Little Green Wall that was nearly covered, and as the surges of the river rose and fell, the feature would change. It was one of the scariest, and most awesome things I’ve ever seen. I was pretty sure this was the biggest, and most continuous piece of whitewater I had ever been on. Every corner I’d pass I was dreading seeing George and Shawn as I knew that meant something had gone wrong, but at the same time I kept hoping we’d catch up to them. Right before Collier Creek we found them eddied out and safe. I was relieved, and we kept going looking for John and Ryan. We eventually caught up to them about 3 miles downstream. Eventually Matt caught up. We all regrouped, and knew we had made it. When we got to the takeout the water was nearly up to the campground. There were a lot of lessons learned or reaffirmed on this trip. Know who you’re boating with. I think there were at least a few people who shouldn’t have been on this trip. I know that at least one of them who was super excited about it in the beginning and a “Class V Guide” was not so stoked later and panic set in. Others that were on this trip really didn’t have any idea what they were getting themselves into. I think that set poor group dynamics where some people went into survival mode, and the few that didn’t then had to pretend everything was ok. There are just a few people I would feel comfortable paddling this water with now. There were too many boats on this trip. Too many boats on water unexplored is just asking for problems. Everyone needs to know that different rules apply to this water. “When in doubt, scout” is not realistic in this scenario. Everyone needs to be comfortable with reading and running this water. Nor can you rely on your other friends for safety. There is no picking up swimmers, or throwing a rope to get you out of a hole. You are on your own. Swimming is not an option. It took a while for me to come to terms with everything that happened on this trip. However, I don’t regret embarking on it. My boating skills grew for sure, but most of all I learned about group dynamics, and who I can rely on when on the water. Every person on this trip pushed the limits of their boating skills and despite what you might feel about our decisions it’s a lot easier to pick out mistakes afterwards. It took me a long time to watch any footage of our trip down the Illinois that February without getting sick to my stomach. At the time of writing this, nearly 8 months later, it is still a great reminder to me of the power of water, and my boating practices have certainly evolved. I’m looking forward to the next trip, and if the right opportunity to run the Illinois at 20,000+ again, I can guarantee I will be considering it. BTW, there is a video out there floating around the internet. I regret this is the only footage we have of our trip, and it was not representative of the performance of anyone else. If you’re into it check it out. It will at least give you an idea of what happens when you get in over your head. Whitewater Queen ~ Genevieve Royer Interview.